scanned images, with high depth of colors (48 bit). All informations can be directly sent to any ERP system, your website or read by any device on your LAN. and accurately inspect any minimal detail. 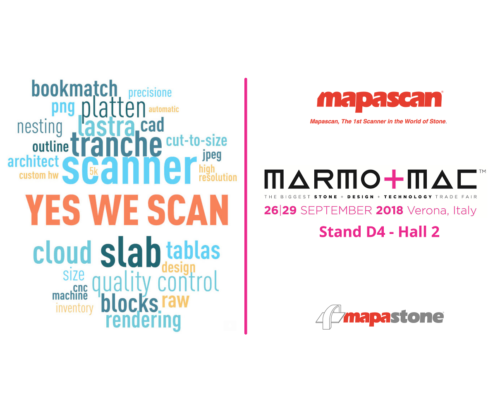 Mapascan is the first and most powerful solution able to scan stone slabs automatically from the line of production. The system allows you to develop an accurate electronic slab inventory, perfectly integrated with web applications or any existing inventory software, using the high definition and high resolution photo. Mapascan, adopted by small and big stone companies, can be used by the operator or in full automation linked to barcode or Rfid systems. Many years of studies and investements, started in 2003, guarantee the best result possibile as of today. Every single component of Mapascan has been designed and created specifically for the stone business like the slab thickness sensor. The high quality of all components, like the touch screen, and the careful choice of every detail make Mapascan the perfect high tech solution. Mapascan is equipped with an optical acquiring device sophisticated and high-definition, unique in the world. Mapascan is integrated with any tracking system for the inventory management, as barcode or Rfid. In this way the Mapascan management is totally automated. Every scan session produces a batch of images and meta-datas, the measurements and the vectorial outline. These informations ca be directly sent to any existing ERP system, your website, your private cloud or read by any device on your LAN. Customer care and software updates are guaranteed in the fastest and secure way through remote access. Our specialized IT Engineers are able to access to any Mapascan installation and complete the maintenance jobs without interrupting the slab production process. In the rare case of a hardware failure, Mapastone can guarantee the supply of any spare part.